<firstimage=”//static.makeuseof.com/wp-content/uploads/2010/11/card.jpg” /> More often than not, when someone gives you their business card, it ends up lost, thrown away, or stuffed in a drawer never to be looked at again. In today’s digital age, it’s natural that the concept of online business cards is becoming more and more common. There are many reasons to stop using traditional business cards, whether you want to be more environmentally-friendly, have easy access to customising your cards, or if you’re just looking for something more convenient. Not to mention, it’s the most cost effective way to create your own business card. There are several free services that make it easy to create your own free personal virtual business cards, and some of these services taking it one step further, making it easier to share them. 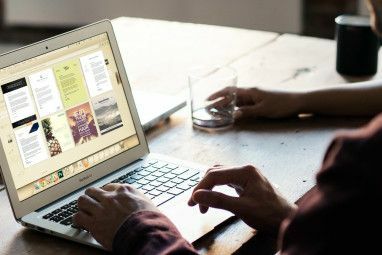 If you’d rather not use a third party service, there are many free WordPress themes to use with your own personal domain. About.me is probably one of the classiest layouts available for a free virtual online business card, taking a very minimalist and user-friendly approach. Currently in private beta, About.me gives you one page and a significant amount of control over how it appears. You can choose your background image, colours and fonts of all text that appear on the page. The services available on About.me include, amongst others, Twitter, WordPress, Flickr, Facebook, as well as any RSS feed of your choice. Visitors don’t have to leave your About.me page to see the content on each site. Clicking on any given icon will open up the latest content posted on each of those services, with a link to the original posts. Another way in which About.me sets itself apart from other similar services is with a dashboard featuring visitor statistics and more. Who would use About.me as their online business card? About.me is ideal for photographers or other visual artists who want to make a strong first impression. If you want to get in on the action, you can. About.me have kindly offered beta invites to the first 100 readers to reserve the username of their choice. Of course, we can’t guarantee the availability of the username of your choice, and if it is already taken, the folks at About.me will let you know. All you need to do is head over to About.me and reserve a URL (username). When you’re done, come back and type in the reserved username into this form. [NO LONGER WORKS] Card.ly has a similar selection of services that you can add to your online business card, from the popular Twitter, Facebook, Tumblr and Digg, to Mixx, Plurk and Friendster. You can also add one RSS feed from your blog, as well as general contact details. Card.ly is also customisable with a variety of themes, however, at the moment you have to preview the themes one by one as there seems to be something wrong with the theme browser. The final card changes depending on the theme you choose. All of the information could be included on the same page or may be divided into tabs. Some themes include a stream of links coming in from your services. Another advantage to using Card.ly is the ability to download a vCard with your information, which makes it easy for others to import your contact information, no matter what kind of address book they are using. So who should use Card.ly? If appearance matters most to you, their wide selection of themes will definitely be a big selling point. If you have your own domain, why not host your own virtual business card using a free customisable WordPress theme. The Digital Business Card Theme is a very easy to use WordPress theme. From the backend, you can add various social networks including Twitter, DeviantArt, Facebook and LinkedIn, amongst many others. The theme is divided into two sections – online profiles, and a contact page with your contact details and a large picture of your choice. With the most basic knowledge of CSS, you can customise the theme to add more profiles that are not included on the list. Other WordPress themes worth giving a try are Ipseity, Visiting Card, and the MiniCard theme. Who would use WordPress to create a virtual business card? 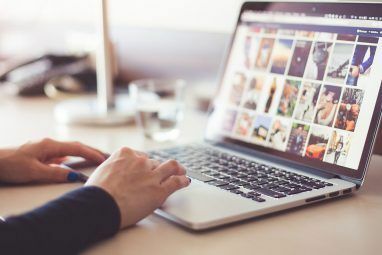 If you don’t want to depend on a third party service that could shut down at any time, or want a highly customisable option, WordPress is the best bet for you. After signing up for a free account on E, you will be prompted to upload a photo, and add your social services and IM contact details. An advantage that E has over other similar services is that you can create multiple cards. 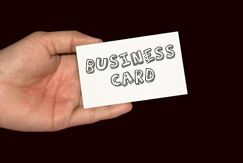 This is particularly useful if you want to create one card for business purposes, and another for social purposes. The final card includes all the details that you add on one page – contact information and social services. E is accessible from any mobile phone, making it easy to exchange details on the go by simple logging into your accounts and adding each other to your contact lists. iPhone users have the added advantage of a free app available for download from iTunes. Who should use E? E is the ideal solution for people who want to create multiple online business cards. 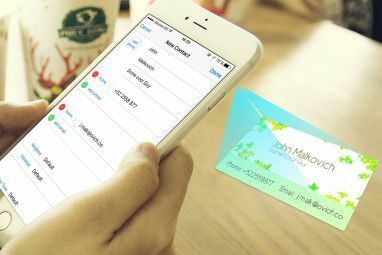 There are many other services that you can use to create your online business card that have been reviewed on MakeUseOf. DooID is a great customisable service that offers the unique feature of video bios. Flavors.me Flavorsme - Create Your Own Free Personalized Webpage Flavorsme - Create Your Own Free Personalized Webpage Read More is a good option for people looking for a bold option with no limit to the colour palettes you can use. Retaggr is another solid option to use that has been around for a while. Have you created your own virtual business card? Let us know in the comments, and don’t forget to reserve your About.me username using the form below. Explore more about: Business Card, Business Technology, Virtual Identity, Wordpress Themes. i use chi.mp ... looks great also. got my about.me as well last week... looks very clean, simple and attractive. I just wonder how this guys will make money. Or is it one of those business models that starts and hopes someday they will figure out how to make money. For us, users, this is bad, we're investing time to create our profiles and don't know if this will last. Good point indeed. I always consider this option before signing up for something I am planning to use for a long time. Thanks for mentioning DooID.com. There's two new features since MakeUseOf's post about DooID: a free mobile phone version for everyone and a automatically generated personal qr-code. Thanks for the great feedback! Thanks for mentioning DooID.com. There's two new features since makeuseof.com's post about DooID: a free mobile phone version for everyone and a automatically generated personal qr-code. Thanks for the great feedback! I've been using Flavors.me for a while now and like the Card.ly interface as well.